Until 2 weeks ago, I didn’t know about this delicious Konkani dish. Daali betti is somewhere between a vegetable pulav and vegetable pongal. This is dry compared to bisi bele bhath. This has toor daal unlike any pulav and is dry in texture compared to pongal. This dish was never prepared at my home, so when I got a request for this recipe, I didn’t know what it is. I asked my mom to go though the request and she said she has heard about this dish. One of my aunt prepares it at home. So when I asked her to get this recipe for me, my dad got it immediately. (Thanks TaraVaini for this). From the list of the ingredients, I felt this dish would be out of the world. I made it for dinner and it turned out delicious. It gets a distinct flavor from ground cumin and ginger. Since this dish is dry, it is served with asafoetida tambli (add water to asafoetida chitney to get a tambli consistency) or ginger tambli (add water to ginger chutney to get a tambli consistency). I added green beans, gherkin and potatoes when I prepared this. Grind coconut with cumin seeds, green chilies and salt to a paste. Heat oil and add mustard. When they start popping, add curry leaves, ginger, vegetables, daal, rice and turmeric. Mix well. Add the paste, around 4 cups water(just enough water to cook daal and rice). Cook directly on stove top or in pressure cooker till done. Serve hot with asafoetida tambli or ginger tambli (see above for description). 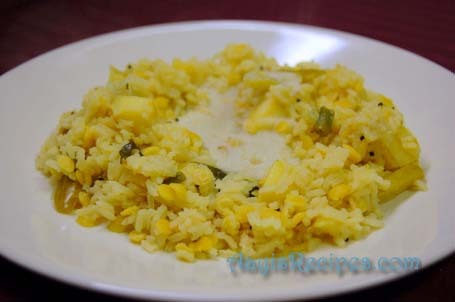 This is very similar to our Gujarati Vaghareli Khichdi, though I don’t add coconut to it. Its a great meal with some yogurt on the side…will have to try your tambli recipes…. Looks good.I had never heard of this dish before , will have to try it. Never heard abt this. Something like khichidi/bhisibela bath (without the masala and coconut) Need to follow this exactly as mentioned. Nice colour and picture. This is a very unusual yet amazingly tasty meal. This can become a breakfast if you like or even a light dinner. It is so yummy that you would want to have more once you taste it. You always bring back the lost gems in our tradition like this. Kudos to your efforts. Highly appreciated. Hi Shilpa, This is nutritious and looks equally tasty. Loved the Afghani soup too! I keep looking your every now and then made recipes from your blog.where do you stay and what you do? I just made Vaghareli Khichdi from The Spice Who loved me. This is a konkani version it. Will try this in few days. I make a similar recipe, but I use moong dal instead of toordal and call it betto! I love Konkani dishes and this one looks nice. Looks like a cross between BBB and Kichdi. Loved it. this is first time to me here.U have lot of interesting recipes…lentil pulao sounds good.is it the same as khichdi of gujarathi cuisine? Trupti, I donno about Gujrathi khichdi, have to check it. Its very strange to know Konkani and Gujrathi cuisines have something in common. Asha, yes its almost like BBB. But taste is very different. I love both equally. Deepa, even I thought its a mixture of rice and varn. Its whole mean since we don’t require anything else with it. Thanks Lalitha. If you try this, please let me know. Hyderabadiz, only bloggers from Hyderabad?? not fair….Just kidding. Thanks aruna, Let me know if you try this. Pi, thanks :D. My main intention of having this blog is to save all such gems. I am grateful to my readers for letting me know about all these dishes. Anupama, Thanks a lot. I try my best to post all kinds of recipes, but still Konkani dishes take more preferance since I am grown up eating these dishes. I am happy to know you like it :). Sailaja, currently I live in Kansas, USA. I am a software engineer by profession. I love cooking. Thanks for trying out my dishes. Please give me your feedbacks. Manjula, I think two of our ancestors heard the daal as well as name differently. One was your ancestor and the other was mine :D.
Pelicano, when will u stop surprising me??? You have some amazing info about Indian cooking. Hats off to you. Let me know if you try this. Sushma, yes, this is drier version of khichdi. Tastes delicious. Gowri, thats a good point. Will try next time. Til chutney and tamarind gojju?? can you send me recipes for those? Thanks in advance. Thanks a lot Linda. I could not approve the comment sooner because I was in office, sorry for that. Thanks for stopping by again. Swapna, I don’t know about Gujrathi khichdi. But Trupti has mentioned above that its same. Tried it this morning, to pack for hubbys lunch. Liked it very much, something a little different than the Gujarathi Vagareli Kichidi, due to the addition of coconut. Very different to Bisebela bath. Thanks again. Tried this for my husband’s lunch.He called me from office to say that it was really good.All thanx to u , cze i don’t know c of cooking.Cooking for me is reading recepies from websites and experementing them.Really a simple yet healthy item.Thanx again. instead of dal she adds soaked and sprouted whole masur and palak. Heat ghee/oil in a pan. Add 2-3 pieces each of pepper corns, cloves and cardamom and cinnamon(1 inch)and bay leaves 2, and little cummin seeds. after it crackles, add chopped onions and fry for a few mins. once the onion is soft and pink add ginger garlic paste (preferably freshly prepared) and cook till oil leaves the sides. then add a tomato and roughly chopped palak(spinach)leaves and sprouted lentil and fry till it leaves oil. Add little corriander powder and cummin powder, turmeric, red chilly powder and salt and fry for a minute. Finally add soaked rice and fry for a minute. Add boiling water to it and cook till the rice is cooked. You can also add cooked rice to the mixture of palak n lentil. But ensure u cook the lentil properly in this case. Add little garam masala. It tastes yummy. Add little more water if u want a khichido like consistency else its as good as a pulav for a party also.. serve with raita..
Shilpa: What were you looking for? Tried it. Thanks for posting it. It tasted heavenly. I paired it with plain yoghurt & pickles.